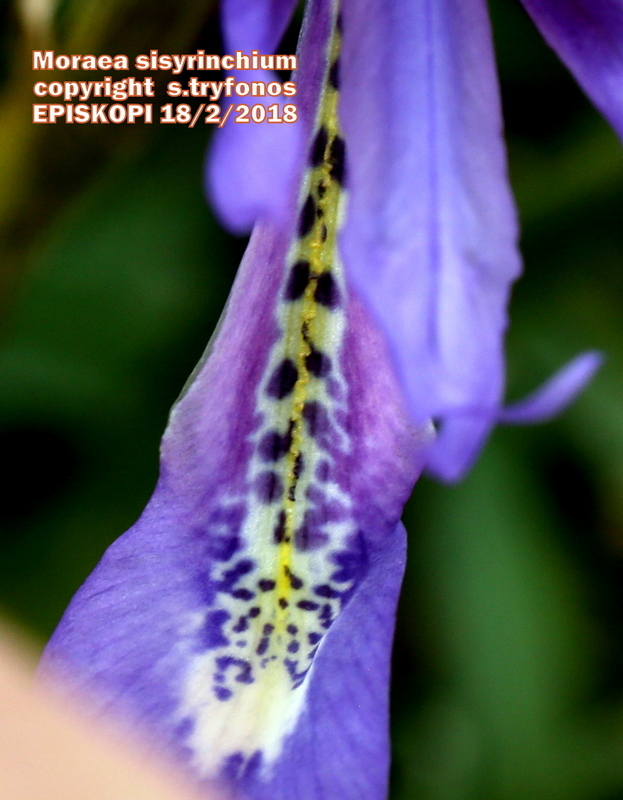 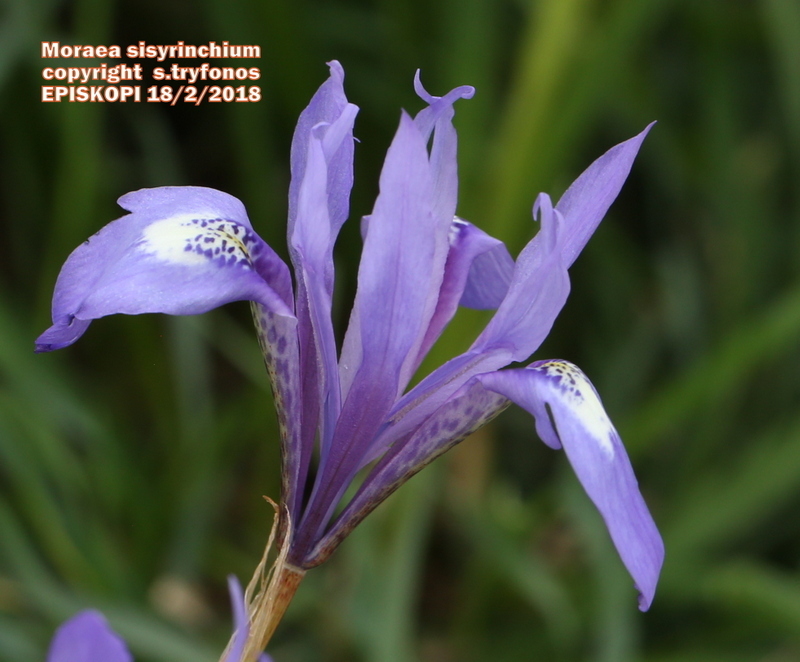 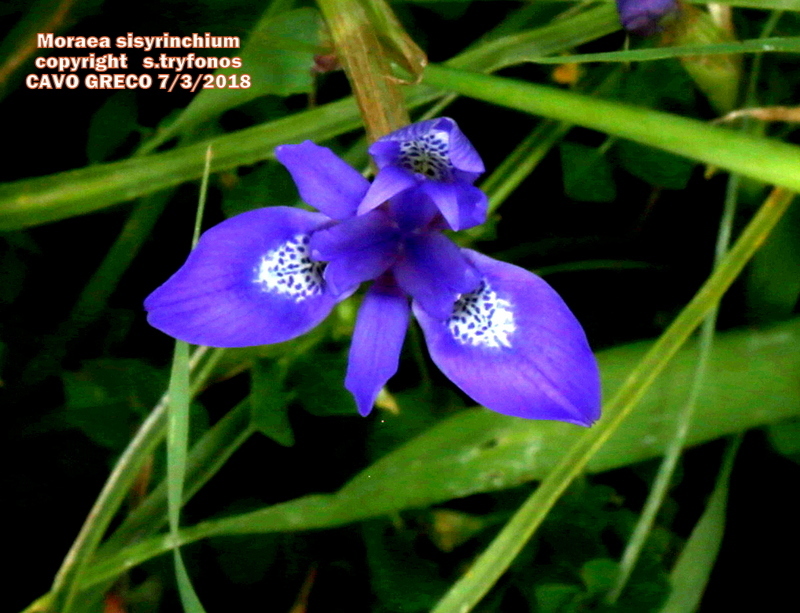 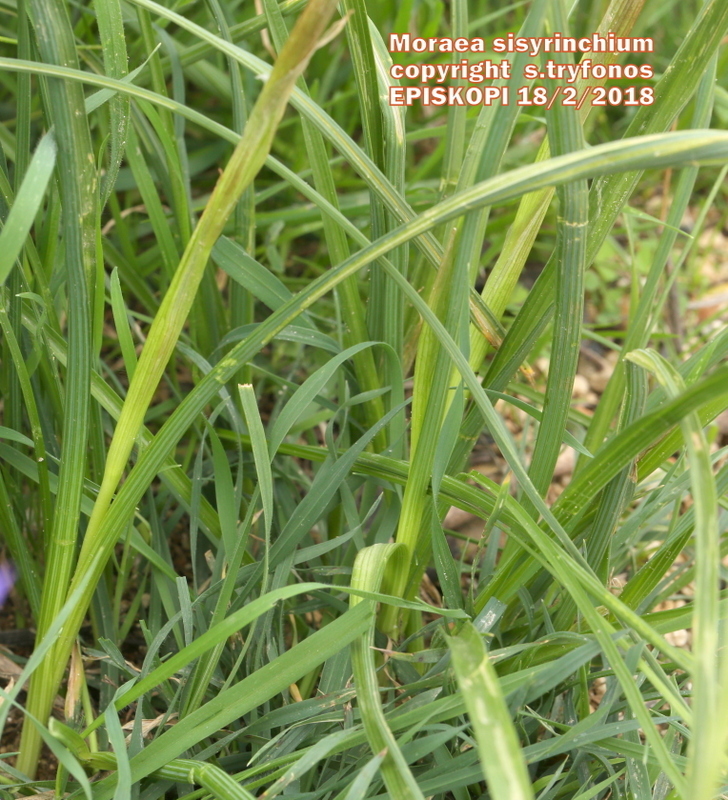 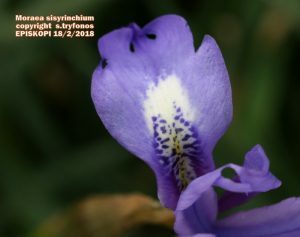 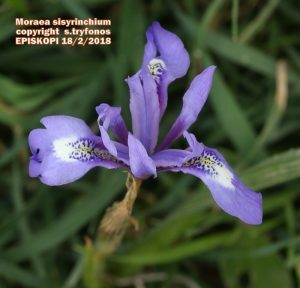 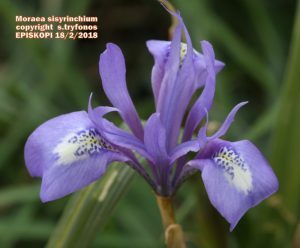 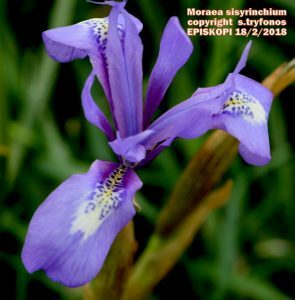 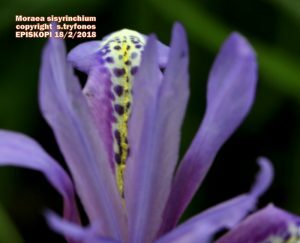 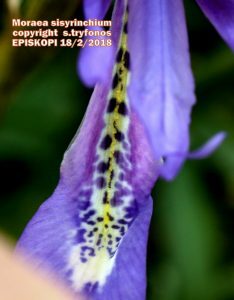 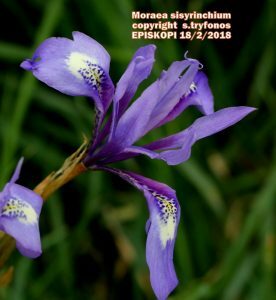 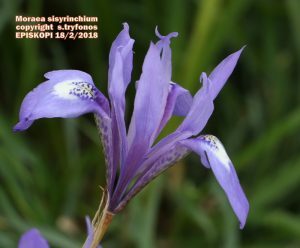 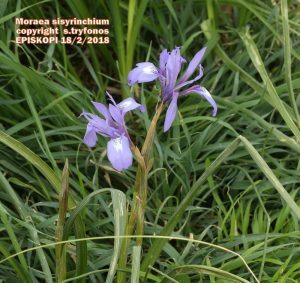 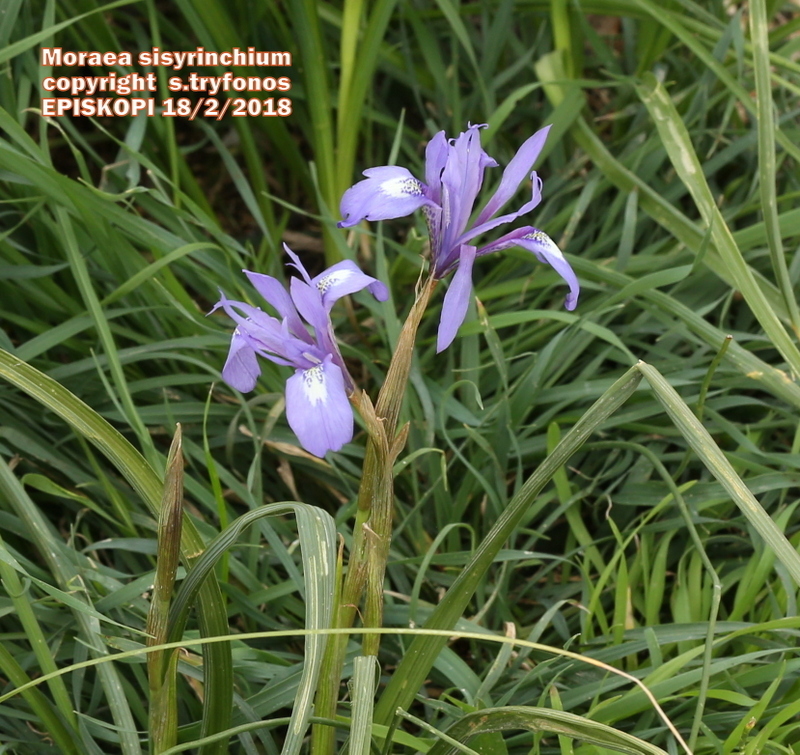 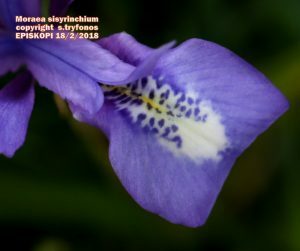 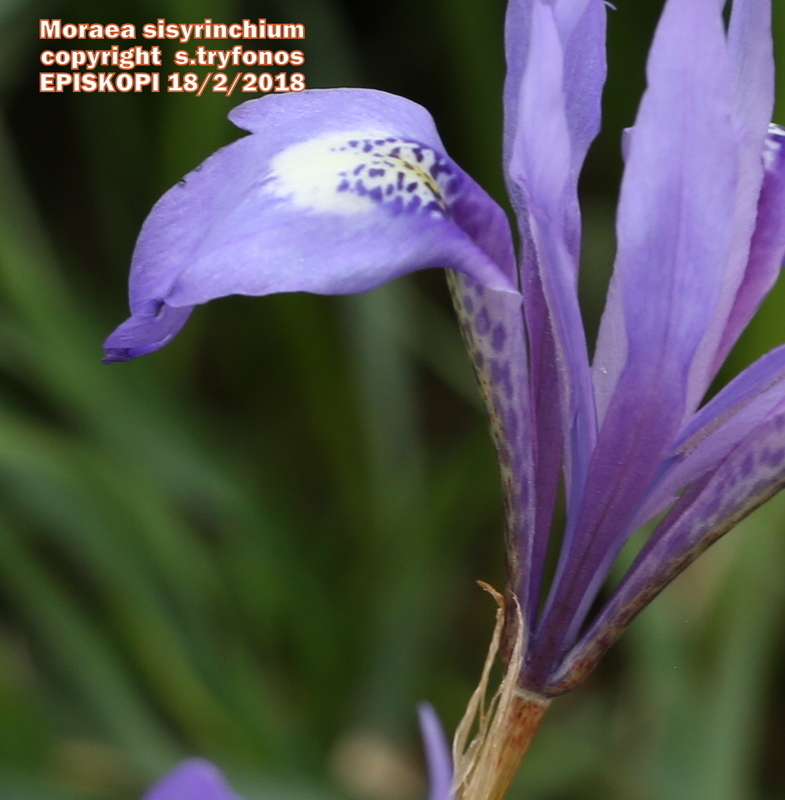 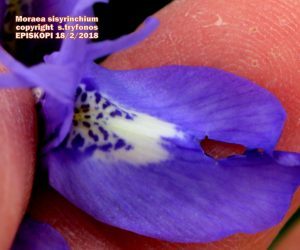 Scientific name/Επιστημονικό όνομα: Moraea sisyrinchium (L.) Ker Gawl. Moraea sisyrinchium is a perennial and tuberous herb with brown ovoid corm, growing up to 50cm high. 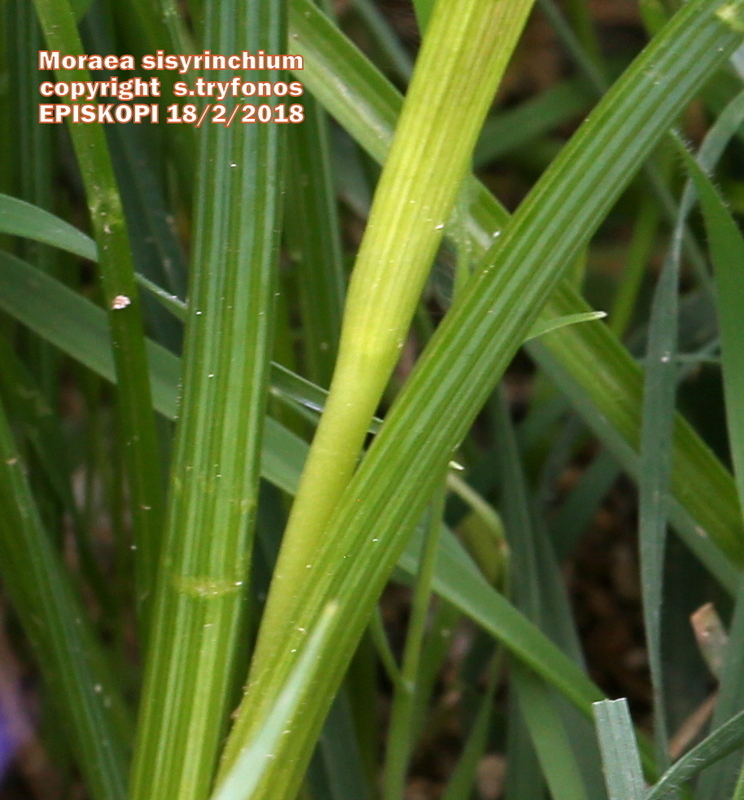 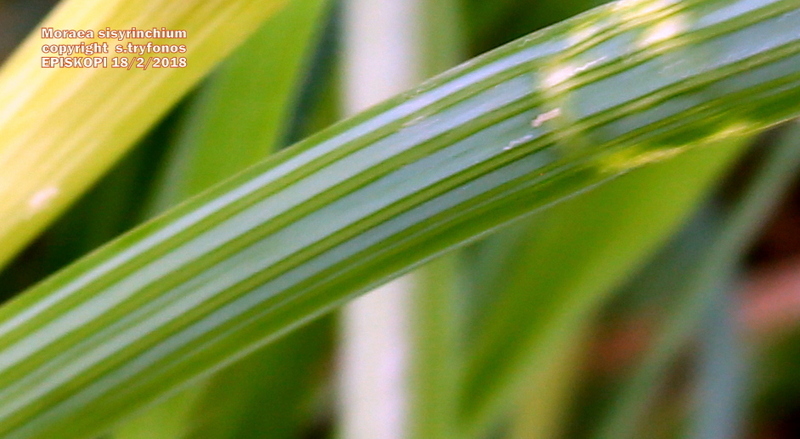 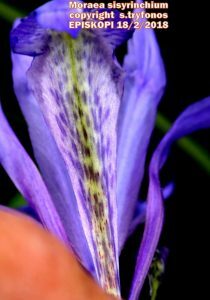 Stem erect, angled, green and glabrous. 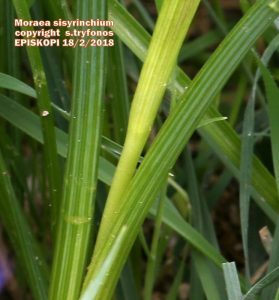 Leaves 2, arising directly from the ground, linear, canaliculate, green and glabrous with prominent venation, often longer than the peduncle, sheathing at base. 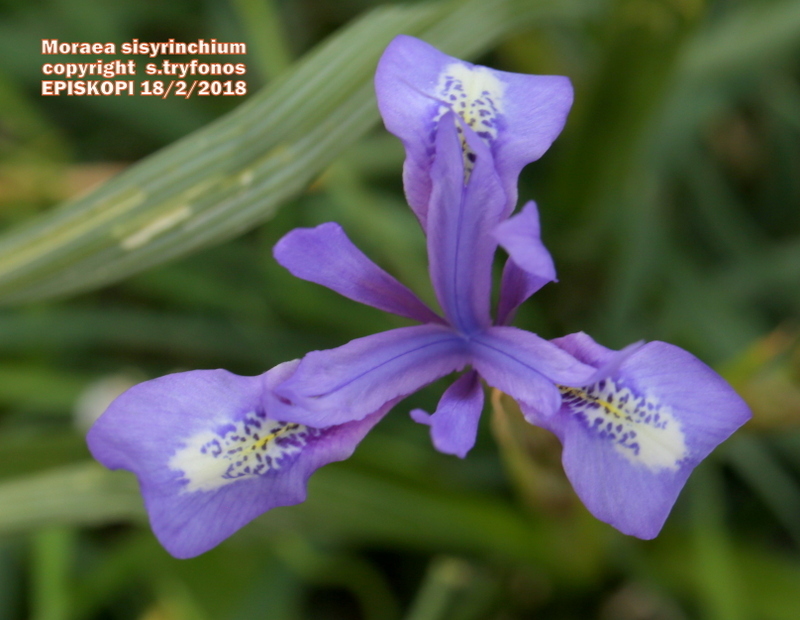 Flowers in 3-5 terminal cymes, hermaphrodite and actinomorphic, in clusters of 2-4; perianth consists of 6 segments in 2 series; externally the 3 segments are obovate in outline, reduced to a claw at base, blue, pinkish-blue or lavender with a white central patch near the base, mixed with blue spots, occasionally the center of the segments tinged pale yellow; upper surface shortly papillose; bracts erect, lanceolate, papery, brownish with prominent nerves, surrounding the stem at base enclosing few flowers; inner segments are smaller but longer than the external ones, erect, narrowly oblong, glabrous, acute at apex; ovary inferior; stamens 3. 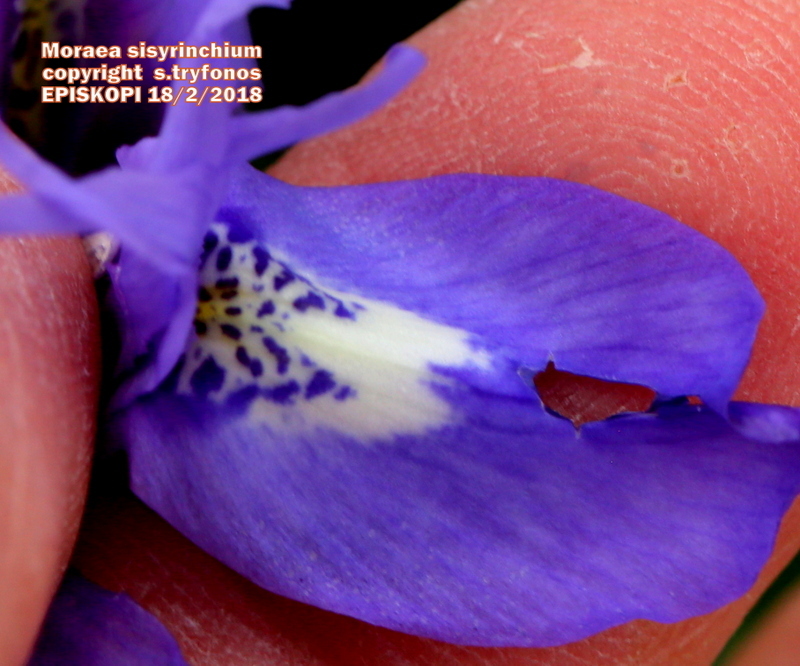 Fruit capsule. Flowering time February-April. 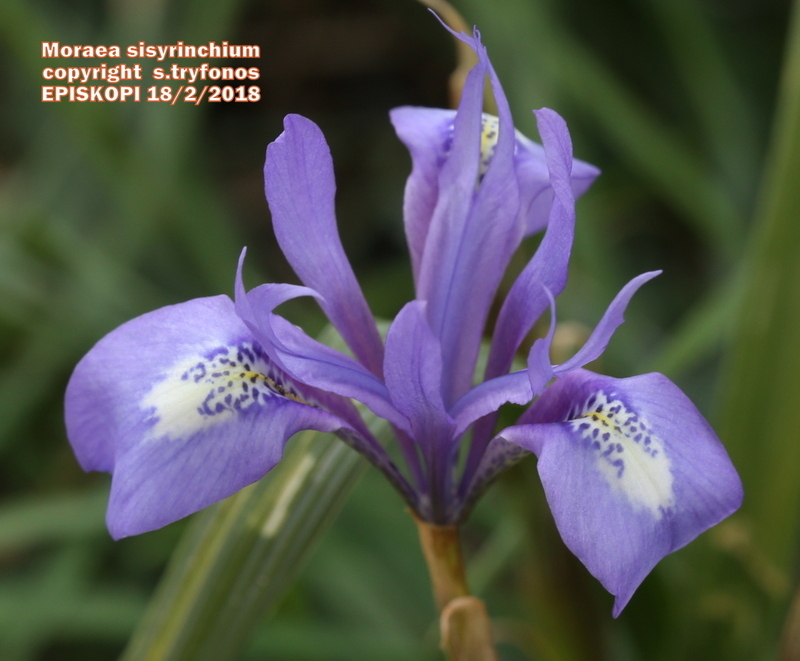 Native to Mediterranean region, Northern Africa and Middle East. 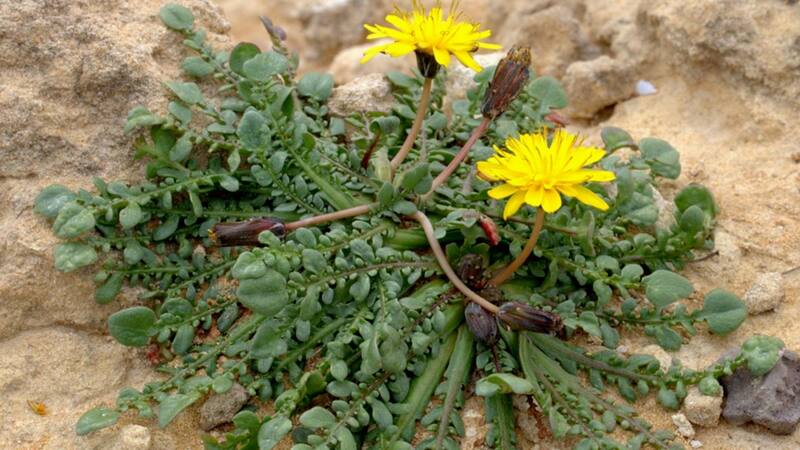 Common plant in Cyprus, on waste ground, stony fields and roadsides, from 0-825 m alt.